Download our FREE Beta Launch Checklist! Check your inbox! Your checklist is on its way. If you’re stuck trying to get started with an online wellness business, we totally understand! If you’re tired of feeling overwhelmed and absolutely baffled about how to tackle the astronomical number of moving parts, you’re not alone. You want to be able to launch your first online program, course, or coaching package without all the stress. You want clarity and step-by-step instructions for how to make actual money with your expertise, so that’s why we’ve put together this FREE Beta Launch Checklist. With the checklist in hand, you can finally start taking taking actionable, meaningful steps towards launching your next online program and seeing those first few sales roll in. No more guessing! Download the checklist today and get notified when we open the doors to our next Beta Launch Workshop. Hi there! We’re Sandy and Jeni and we know our way around the Internet. We help wellness practitioners build online businesses so that they can grow a bigger following, impact more people, and make more money. We left careers in law and clinical practice because we wanted the freedom and flexibility to live life on our own terms AND we felt the pull to be more present to our growing families. But we still felt drawn to contribute, to build, and to create. In the past 5 years, we’ve grown a thriving software company, a binge-worthy podcast, and a lucrative online teaching business. We can’t wait to help you realize your own entrepreneurial vision. Learn How to Launch Your First Online Program in 30 Days! 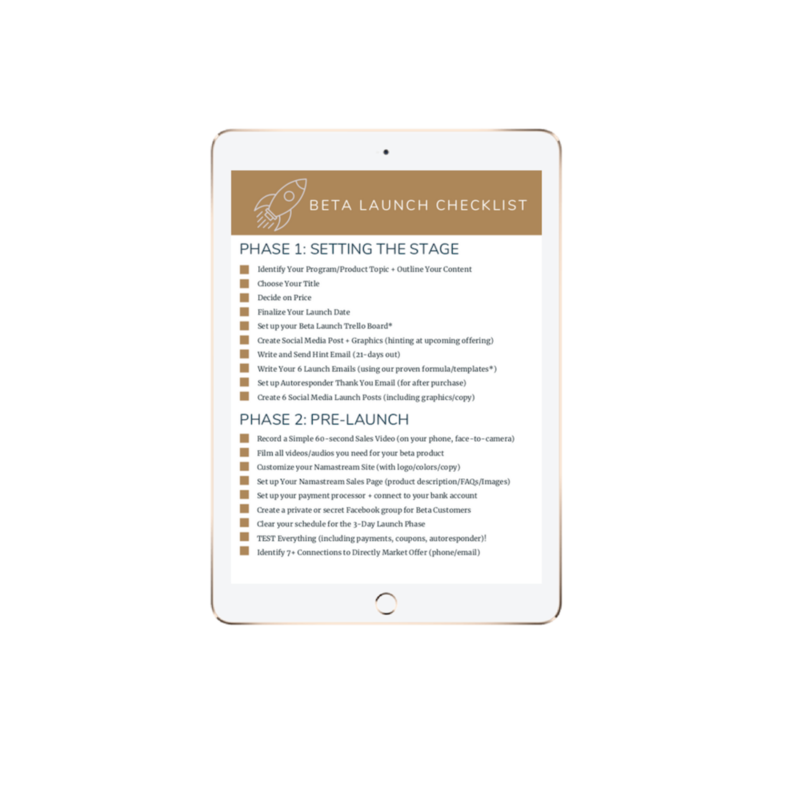 Grab your FREE Beta Launch Checklist, which outlines our step-by-step process for launching your first online course or membership site. Wonderful! Check you inbox for the checklist!